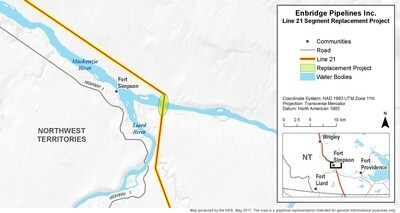 CALGARY, May 19, 2017 /CNW/ - The National Energy Board (NEB) announced today that it will hold a public hearing to review an application from Enbridge to replace a section of its Line 21 pipeline in the Northwest Territories. The hearing will begin the week of August 8 at the Fort Simpson Recreation Centre. To help participants understand how the NEB will review this application, NEB staff will hold an information session on June 6 at the Fort Simpson Recreation Centre starting at 7 pm. The NEB's Participant Funding Program is providing up to $100,000 in funding to support meaningful participation by intervenors in the hearing process. The National Energy Board is an independent federal regulator of several parts of Canada's energy industry. It regulates pipelines, energy development and trade in the public interest with safety as its primary concern. For more information on the NEB and its mandate, please visit www.neb-one.gc.ca.